Canadian Pizza is partnering with FoodPanda Thailand for internet and mobile app orders. FoodPanada will deliver all online orders. See Order Online for details. We operate a single call number - 02-872-4141 for telephone orders. Our call center representatives will service your order in English or Thai. Give us your name, contact telephone number and delivery address with your order details. We do delivery for orders 399 THB and above. FREE delivery to limited areas only. if your delivery location is within our delivery zone, a small surcharge may be imposed. Kindly confirm with our call center whether there is the delivery charge for your order. Our target delivery service level for orders within our delivery zone is 1 hour from the time your order has been confirmed by us. Although we undertake our best efforts to ensure that your order arrives as fast as possible, we seek your understanding that there may be instances beyond our control which may cause delay the delivery times due to the traffic conditions in Bangkok especially during peak hour. 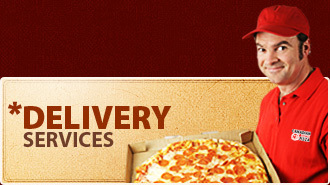 Our call center will call you to let you know in the event that there is a delay in delivery. Our delivery staff only carry a maximum of 150 THB so kindly assist them with the correct change.